Having a working HVAC system is a great benefit to every home. The comfort it provides year-round is advantageous to your home and to your family. When the temperature starts to warm up and you start to rely more on your air conditioning, it’s important to make sure that it runs smoothly. If you start to notice problems with your current unit, such as uneven cooling or lack of cool air, try this simple method first: clean out all ducts and change the filters. Then, lower the temperature to test coolness level. If after this you are still experiencing issues, then you may need an air conditioning replacement. At Cool Comfort Heating & Air, our team is here for you. Backed by years of expertise, we’ll have your unit up and running in no time. What about cost? We have options to fit any budget plus rebates and payment plans. Why put off an air conditioning replacement? You’ll save more by not having to call in for constant repairs, and you’ll also extend the life of your current HVAC unit. In addition to saving, you’ll also improve the air quality in your home. A faulty unit can be responsible for humid or dusty air, something no one wants their family exposed to for long periods of time. Having an air conditioning replacement will only help. 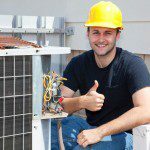 HVAC systems are long-lasting, but if you notice reoccurring problems after 10-15 years of installing the unit, then it’s time for a replacement. Call us today to learn more!